Easy weeknight chicken Parmesan is perfect for when you have to put dinner on the table, and you want something simple to put together that tastes good. There are always a few ingredients that I have in the pantry, spaghetti sauce in the jar. While sometimes I make spaghetti sauce from scratch, I also sometimes need to put together a meal when I have gotten home from a long day, and it beats re-heating something that came pre-packaged and out of the freezer. I always keep a few frozen chicken breasts in the freezer. I love the individually wrapped ones because I can defrost those quickly in a sink of warm water. I must say the inspiration for this recipe came from the Housewives of New York City. For almost two years I have heard Sonja says she can cook anything in a toaster oven. Well, I don’t have a toaster oven, but I think I heard her say she makes this dish, there were no instructions, but since I copy other people’s recipes, this one wasn’t hard to figure out. One additional benefit of this recipe is that it is low-fat, and low in calories. There is no breading and nothing is fried. This recipe naturally tastes good just like it is. 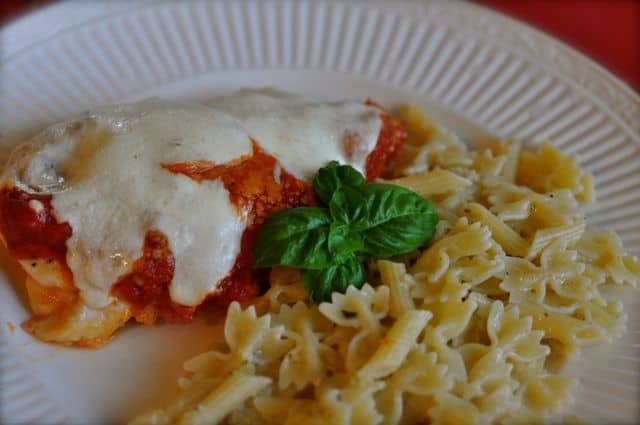 You can make a delicious chicken parmesan at home. Preheat oven to 375 degrees. Spray non-stick spray in a 9 x 13 inch baking dish. Season chicken breasts with garlic salt and pepper, place chicken in baking dish. Top chicken breasts with sauce, cover chicken breasts completely. Bake chicken breasts for approximately 20 minutes, remove chicken from oven. Sprinkle Parmesan cheese on top. You may add Mozzarella cheese if you like. To brown the cheese, turn your oven on broil and broil until the cheese turns brown, this may only take a minute or two. I am attempting to make chicken parmesan in my toaster oven. I live in a hotel and make do with what I have. I made my own sauce, browned chicken breasts and topped with sauce and cheese. Broiled until bubbly. Deeeelicious!!! Kale with parmesan and garlic as my side and toasted buttered bread. It is wonderful!!! Tried my first recipe of easy chicken Parmesan. I had no leftovers, family loved it and asked where I found it. Thanks will try more! I am glad you enjoyed this one. I love this dish. It is so easy to make. What a great idea about defrosting chicken. Much safer. The dish looks delicious! Thank you so much. It is great way to defrost the chicken. It doesn’t take long at all.